Coming off of their recent hits Reply 1988 and She Was Pretty last year, Ryu Jun Yeol and Hwang Jung Eum team up for a rom-com titled Lucky Romance. The drama has an unusual premise predicated on the topic of luckiness and the consequences of ridiculous superstitions. Our very superstitious heroine is on a hunt for a man who can counteract her bad luck, and ends up meeting a calculative polar opposite guy. I’m sure you can imagine the love-hate relationship blossoming from here on. Lucky Romance‘s not-so-serious and refreshing concept makes it a lighthearted and fun summer pick-me-up for just about anyone. With cute leads, great characters, and a tight pacing, the drama delivers a lovely story and numerous unforgettable characters. 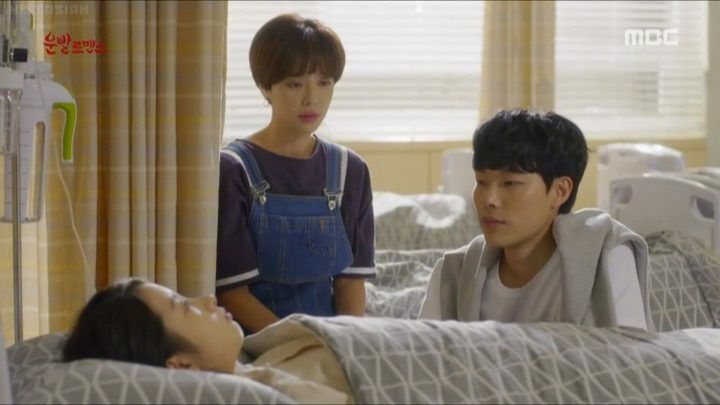 Though quite a stretch from reality, the premise of Lucky Romance and its characters are simple, which make it effective at getting straight to the point and plugging the viewers right into action. Our story begins with Je Soo Ho (Ryu Jun Yeol), a genius with IQ of 200 and the CEO of gaming company Zeze, going through a bit of a rough patch until heroine Shim Bo Nui’s (Hwang Jung Eum) game concept catches his attention. Soo Ho is someone who lives by the numbers, emotionless, and socially awkward due to childhood isolations. On the other hand, Bo Nui is a happy-to-lucky gal who considers herself to be very unlucky and constantly practices superstitious acts to avoid bringing bad luck to those around her. We soon learn that the reason she firmly believes so is because a shaman said her evil spirit caused her parents’ death and her younger sister to be in a coma. To save her sister, she must spend a night with a man of the Tiger zodiac sign. Lo and behold, after a few coincidental interactions, Bo Nui realizes that grouchy, logistical Soo Ho is the only legitimate Tiger man around. I think this is a cute premise, because rather than focusing heavily on the sad aspects of Bo Nui’s life and her sister, we get the more lighthearted and fun parts, which make all the difference in the enjoyment of the drama. The comedic tone definitely worked in the drama’s favor. It delivered on comedy, love lines, and drama in equal weight. We’re also introduced to the second leads, Gary Choi (Lee Soo Hyuk) and Amy (Lee Chung Ah), whose pasts tie in with the leads. Gary is Bo Nui’s childhood friend and longtime secret admirer. He moved to Canada as a child and is now a famous tennis player. Despite the long time apart, Gary still holds fond memories of Bo Nui and decides to take two months off in Korea to reconnect with Bo Nui. Amy, also known as Gary’s agent, studied in the U.S. with Soo Ho during college and was his first major crush. These relationships may seem to be a little too convenient, but the show pulls them off rather naturally, rather than forced. I’m left laughing off my seat between all of their interactions and excited for what’s about to happen next. These first few episodes of Lucky Romance really delivered on comedy, love lines, and sentimental drama in equal weight so you’re left feeling empathetic towards the characters. Each episode also showcases a little of each characters past, making them go by fast, and has me clicking on to the next one just as fast. Another interesting thing the drama does is show you a small hidden scene at the end, often something crucial to help shed even more light on a sequence earlier in the episode. It’s always well done and rather informative, which makes me look forward to them. All in all, Lucky Romance has me hooked. These next few episodes of Lucky Romance really showcase why everyone’s fallen for not only Soo Ho as a character, but also this seemingly contradictory lead couple. Although Soo Ho doesn’t believe in the superstitious things that Bo Nui’s practically dedicated herself to, he agrees to be her talisman. It shows that his curiosity in Bo Nui’s crazy lifestyle has advanced to not only caring for her, but also genuinely falling for her. I think Soo Ho feels particularly refreshing as a character because most male leads come off as aggressive, but he is more passive and inexperienced with expressing himself. For examples, when Bo Nui is close to getting herself into danger, Soo Ho does go out of his way to make sure she’s safe, but once he confirms that she is, he doesn’t abruptly shows up in front of her or tries to interrupt her normal flow. By standing on the sidelines, he’s done more for her as a talisman, friend, and respecting her life than a lot of male leads ever have. Meanwhile, Gary works on finding his father that went missing when he was child. He clearly relies on Bo Nui during his more vulnerable moments, but at the same time, he almost sounds demanding when he asks her to accompany him during an interview. At first Bo Nui declined, but ultimately agreed because of her kind-hearted personality. Add on top Gary’s frequent jealous-filled pouting scenes, their interaction definitively comes off as a mature adult dealing with a child rather than any sparks of romantic chemistry. Likewise, Amy works hard to get Soo Ho’s attention in hopes of rekindling their old spark, despite him clearly having moved on from her. Her over-confidence convinced herself that Soo Ho’s still into her, making her advances humorous to watch, albeit unwanted. The extension of relationships between these four characters keep these episodes engaging and amusing to say the least. During this section of Lucky Romance, we witness the climax of confessions and the push-and-pull tension between our lead characters. It’s hilarious to see our leads interact now that Su Ho isn’t denying his feelings to himself or his friend. 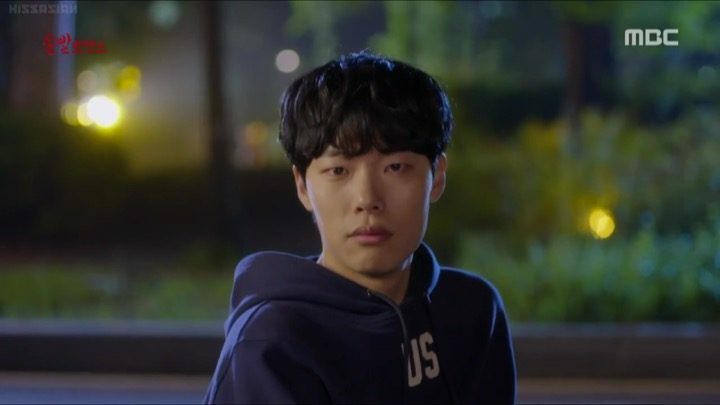 The once calm and collected Soo Ho seems to have flipped a switch and changed into a different person thanks to being in love — antsy, childish, petty — he’s got the whole shebang. Bo Nui on the other hand, senses the dynamic change, but is in a bit of denial, afraid to take any step further. I understand that a lot of her hesitation comes from how she considers herself to be unlucky, and I think it’s convincing enough of a reason for me. She’s only had poor experiences because of it, and doesn’t want anyone else to suffer because of her. They’re constantly thinking of each other, but because Bo Nui can’t be with him right now, more drama also arises from her indecisiveness. They soon acknowledge that they like each other, so the issues aren’t a matter of miscommunication, but rather, timing. I appreciate this because they can openly talk about the future of their relationship rather than beating around the bush. It also makes their love line that much more authentic and believable. Soo Ho firmly commits to being her talisman and combating her unlucky streak willingly, so the romance really works amidst all the comedy and drama. However, I can also see how the “I’m cursed” plot device may seem overplayed and too convenient of an excuse to some viewers. On a more disappointing front, our leads getting together meant that our second leads start to get a little annoying here. Gary and Amy are doing things I find nonsensical to get the attention of their crushes, making it hard not to roll my eyes occasionally. The final stretch of Lucky Romance is just what I needed — both entertaining and satisfying. Besides our leads obviously ending up together, the straggler plot lines with Gary’s father and Bo Nui’s sister’s condition also wrap up nicely, leaving viewers pleased but not surprised with the results. I do however, have some remaining issues with how the drama resolved Gary’s feelings for Bo Nui, as it seemed like he only did it to save face, which I found to be a bit awkward. I also didn’t think it was necessary to throw in Bo Nui’s actions that caused her to be separated from Soo Ho for a bit towards the end, especially when I know they’ll be back together soon enough anyways. Despite those minor issues, I have nothing but praise for the drama overall. Lucky Romance has been one of the strongest dramas I’ve watched lately with a distinctive premise, lovable characters, and unbeatable couple chemistry. I definitely think fans of rom-coms should check it out and won’t be disappointed.